Preheat oven to 325. Put sweet potatoes in a medium saucepan with water to cover. Cook at medium heat until tender; drain and mash. 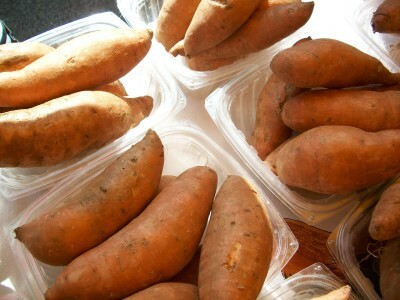 In a medium bowl, mix together mashed sweet potato, 1/2 c. sugar, eggs, salt, butter, milk, and vanilla until smooth. Transfer the mixture to a casserole dish. In a medium bowl, mix together 1/2 c. sugar and flour. Cut in the butter until the mixture is coarse. Stir in pecans. Sprinkle this mixture over the sweet potatoes. Bake for 30 minutes or until topping is lightly browned. I mixed the sweet potato filling part up the day before and refrigerated it until I baked it off right before the meal.